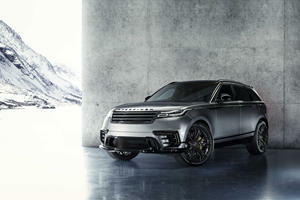 The newly released Range Rover Velar is available in either 247 hp 2.0-liter gasoline, 180 hp turbo diesel or 380 hp supercharged 3.0-liter V6 forms. All feature a smooth shifting 8-speed automatic transmission and all-wheel drive. Performance levels are good throughout with on-road dynamics much improved over previous Range Rover products. Notable available features include air-suspension, 17-speaker audio system, rear seat entertainment package and a driver condition monitor. The Range Rover Velar is the latest in Land Rover’s line of luxurious SUV models and is the most on-road biased offering it has ever had. Based on the dynamically capable Jaguar F-Pace, the Velar slots in above the Range Rover Evoque and below the Range Rover Sport. Available as an all-new 2018 model, the Velar comes equipped with a range of standard and available options that place it firmly at the forefront of the midsized luxury SUV category. Whereas older Range Rover products tended to lag behind the best in-class when it came to available technology and material quality, the latest Velar offers the very latest infotainment system and the cabin is covered in soft-touch plastics, high quality leather and h carpeting in the footwells. Two large touch screens now dominate the dashboard and the majority of vehicle functions are controlled through them, the switches and buttons that remain are all quality items too. Pitched as a more dynamically capable vehicle, the Velar is more compact than a Discovery yet still offers sufficient space for five adults and their luggage. Cargo space is commendable and compares well with the competition. The Velar shares a lot of its chassis design with the recently introduced F-Pace although it rides a little higher and offers more off-road ability in true Range Rover tradition. City and highway driving reveal a supple suspension and a quiet cabin. All as one would expect from this class of car, the real differences lie in the way the Velar tackles more challenging roads, it feels planted and unflustered when pushed and the controls feel sharp and responsive to driver inputs. The available 22-inch wheels may not be ideally suited for off road conditions though. The Velar does play second fiddle to the on-road class leaders like the Macan and X3 but neither can match its classy exterior styling or off-road abilities. 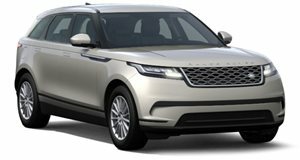 The 2018 Range Rover Velar is available with 3 engine options all equipped with permanent four-wheel drive and an 8-speed automatic transmission. 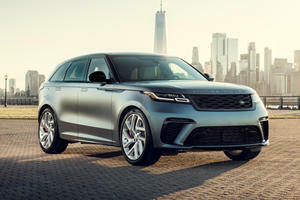 The base turbocharged 2.0-liter gasoline engine produces 247 horsepower and 269 lb-ft of torque which gives the Velar a competitive 6.4-second 0-60mph time. Shoppers looking for enhanced fuel economy may prefer the turbo diesel version which is also a 2.0-liter and offers 180 hp and 317 lb-ft. 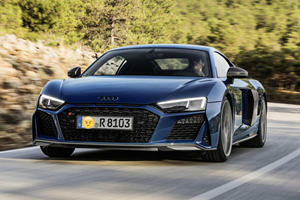 The 0-60 mph time is down to 8.4-seconds but thanks to all that torque, in-gear acceleration is strong. For the power hungry the 3.0-liter supercharged V6 will be a good fit, with 380 hp and 332 lb-ft on tap the 0-60 mph time is dealt with in 5.3-seconds. The Range Rover Velar is offered in 3 main options, namely Velar, R-Dynamic and the limited First Edition. Trim levels are subdivided into base, S, SE and HSE. The base Velar comes equipped with the 2.0-liter gasoline engine and offers an 8-speaker audio system, suedecloth seats, heated door mirrors and a range of safety devices including autonomous emergency braking, rearview camera and a rear parking aid. S trim adds notable features like navigation an upgraded audio system, power leather seats and the option of all three engines. Velar SE trim is limited to the 380 hp V6 engine and adds a 17-speaker audio system, navigation pro, reverse traffic detection, driver condition monitor and 20-inch wheels. R-Dynamic starts with SE trim and includes all of the above as well as upgraded front seats with heating and cooling function and some unique exterior details. All three engine options are available on this trim level. R-Dynamic HSE adds 21-inch wheels, uprated interior trim, and 20-way powered front seats with massage functionality.<br> <br> The First Edition trim is limited to 500 units and features the 380 hp V6 and just about every conceivable extra as well as most of the standalone options such as air suspension, 22-inch wheels, head-up display and 23-speaker audio system. The Range Rover Velar enters the very hotly contested midsize luxury SUV market with a very good chance of becoming one of the top choices. It blends luxury, all-terrain ability and excellent safety and technology features into a very stylish body shell. It may be eclipsed in on-road dynamics by the Macan but it is still a very capable SUV and it matches or beats the competition in just about every important area.